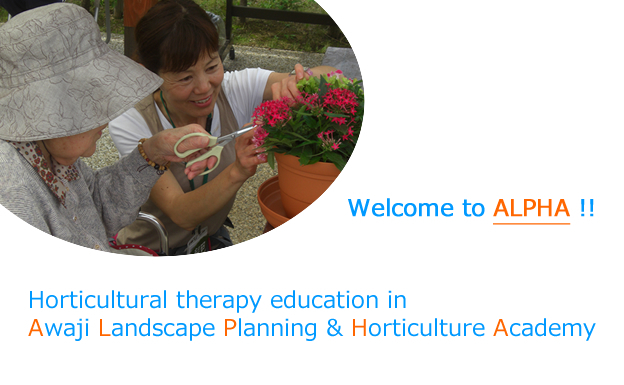 Awaji Landscape Planning & Horticulture Academy is a very unique academy established by Hyogo Prefecture in 1999. It has three courses: Graduate School of Landscape Planning, Lifelong Learning Course, and Horticultural Therapy Course. 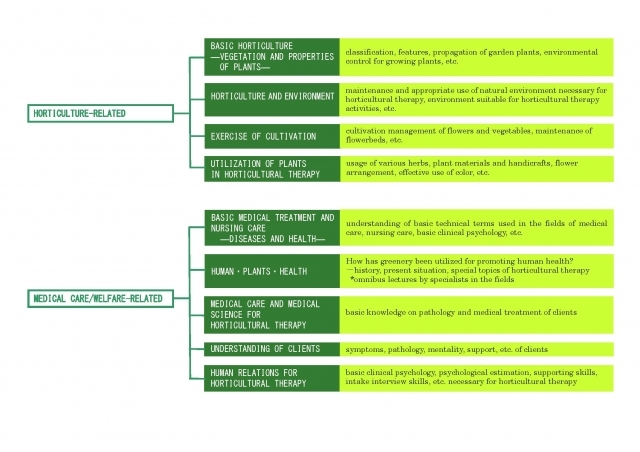 Horticultural Therapy Course is the only one course in Japan to train horticultural therapists authorized by a local government, which was established in 2002 after the Hanshin-Awaji Earthquake in 1995. The graduates of the course are authorized as horticultural therapists by Hyogo prefectural governor. Our prefecture got much boost from all over Japan and the world in 1995. So the mission of this course is to train the experts who can heal people in need of support by means of plants, greenery environment and gardening activities and eventually to reciprocate people’s favors and assistance from all over Japan and the world. 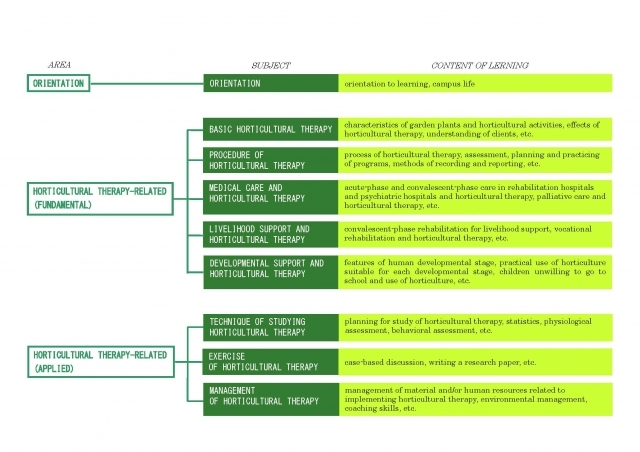 At the beginning of Horticultural Therapy Course, the curriculum was drawn upon the core curriculum of American Horticultural Therapy Association (AHTA). It had 84 semester credits (945-hour) lectures and 1000-hour clinical internship. AHTA changed their professional registration requirements in 2008. ALPHA also started its original curriculum to train horticultural therapists in 2011. The original curriculum was made in consideration of Japanese HT conducted in hospitals, welfare facilities and educational fields. It consists of 36 semester credits (405-hour lectures) and 800-hour clinical internship (Table 1). Till 2011, there was only one course of boarding for one year. In April 2012, the commuting course for two years will start. Both courses have the same curriculum. The number of graduates is 125 in nine years since the start of the course. 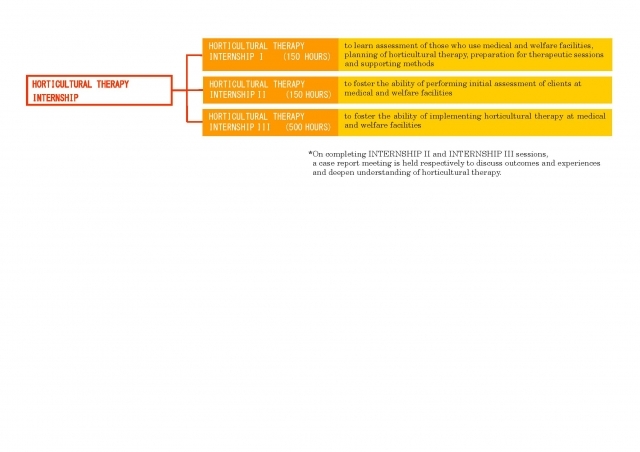 Most students have experience of working before entering this course. Their occupations are nurses, occupational therapists, care workers, teachers, children’s nurses, gardening company workers, etc. and forty to fifty-year-old homemakers after child-raising or post-retirement people are also included. Their fields of activities after graduation are the medical field, the elderly welfare field , the educational field, gardening companies, etc. Although hospitals and welfare facilities which employ full-time horticultural therapists are increasing, the number is not so large now. So most graduates return to their previous fields and they are working as horticultural therapists with dual jobs, such as a nurse and horticultural therapist or a care worker and horticultural therapist. © Hyogo Prefectural Awaji Landscape Planning & Horticulture Academy, Horticultual Therapy Certificate Program. All Rights Reserved.